Can Herbs Help You Get Rid of Ingrown Hair? An ingrown hair occurs when a shaved or tweezed hair grows in and curves back into the skin, causing inflammation, bumps and pain. While ingrown hairs are particularly common in African-American males between the ages of 14 and 25, anyone who shaves can experience ingrown hairs, report doctors at the Mayo Clinic. Untreated, ingrown hairs can cause irritation, bacterial infection and permanent scarring. The best way to rid yourself of ingrown hairs is to stop shaving or tweezing, but once you get them, they can be treated with prescribed medications to reduce inflammation. There are a number of herbs that also can be used to reduce inflammation and rid yourself of future ingrown hairs. Researchers at the National Center for Complementary and Alternative Medicine (NCCAM) report that evening primrose oil can be effective for reducing the inflammation caused by ingrown hairs. The plant has been used since the 1930s to treat eczema, which is a condition caused by infection and other skin conditions that cause itching and scaling. Evening primrose oil contains gamma-linolenic acid, which is an essential fatty acid that is vital for proper hair growth and good circulation. The oil is extracted from the plant and typically placed in gel capsules for use. Side effects are not typical in most people, but may include a slight headache or nausea. One use of fenugreek is to take the seeds and make a paste to apply directly to the inflamed site of the ingrown hair to reduce swelling, although the NCCAM reports that there is little scientific evidence to support its efficacy for topical skin applications. Fenugreek has historically been used to encourage delivery, so it should not be used by pregnant women. Turmeric is a long-standing staple in the history of Chinese and Ayurvedic medicine. The stem of the plant is used to make a paste that can be applied directly to the skin to reduce inflammation or taken orally for general inflammation relief. Turmeric is in the ginger family and primarily grown in India and Asia. Although there is little firm scientific proof of its effectiveness, preliminary studies show promise for the use of turmeric to reduce inflammation, report NCCAM researchers. There are no side effects from the topical use of turmeric, but high doses taken internally can cause indigestion. 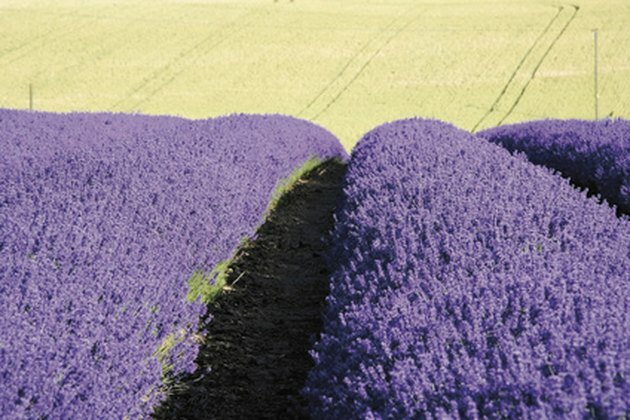 NCCAM researchers report that lavender may be useful in treating alopecia areata, or hair loss, a condition that often results in ingrown hairs that don't grow out properly. Lavender originates in the Mediterranean region and historically has been used as an antiseptic. When applied to the skin, lavender can cause additional skin irritation. Try a small amount on one hair before applying to larger areas. Lavender oil can be poisonous when taken orally. Does Nettle Root Work for Hair Loss?